The Russian Ponzi scheme mastermind confirms his direct involvement in the MMM financial pyramid in India. Last week, police in the Indian state of Assam arrested three Russian citizens for running a chit fund scheme on behalf of Mavrodi Mondial Moneybox India. Alexei Muratov, Danis Rosaov and Andre Kilyn were arrested with their Indian accomplices after many state governments warned citizens to not be duped by the Mavrodi schemes. 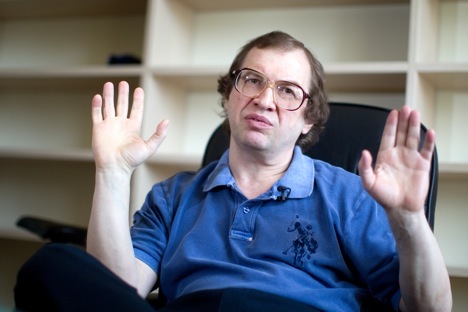 In an interview with Life News, Sergey Mavrodi, the mastermind of Russia’s biggest Ponzi scheme, confirmed his direct involvement in the MMM financial pyramid in India. “It is our structural unit,” Mavrodi told the web-site, while denying that he personally knows Muratov. Mavrodi Mondial Moneybox India was founded last year by Mavrodi, who describes it as “a community of people who are changing the world” and perhaps more significantly as “people who have no guarantee of repayment of their funds.” His team allegedly attempted to defraud members of the public in Maharashtra, Andhra Pradesh, Punjab and Gujarat, besides Assam. The now-arrested swindlers organised seminars and conferences to promote the company using charity events as a cover. Life News said at least 25 people fell victim to the scams. Clients of the firm were invited to make an initial contribution of 5,000 rupees (about $90). According to Life News, one of the Russians posed as a journalist to increase the semblance of authenticity. In the 1990s, millions of Russian citizens suffered at the hands of the original Russian version of MMM. The Ponzi mastermind is now trying to set up new financial pyramids. Mavrodi, a former mathematician and computer programmer, set up a pioneering Ponzi scheme in Russia in the early 1990's, which rapidly gained huge popularity among thousands of investors among a population in the Soviet Union with scant previous knowledge of private investment. Investors joining the scheme early on made impressive profits, while those piling in later lost everything, leading to a catastrophe as MMM collapsed. Mavrodi was arrested in 2003, and was sentenced by a Russian court to four years in jail on fraud-related charges in 2007. But he was released the same year because he had already served most of sentence in pre-trial custody. When freed, Mavrodi re-launched similar schemes, setting up MMM branches both in Russia, Ukraine, the Baltic States and elsewhere, with the ambition of “destroying the global financial system,” as his website said. Based on materials from LifeNews.